Helechos de Cuero S.A. | Producers of floral greens in Costa Rica. Helechos de Cuero S.A. is one of the leading producers and exporters of floral greens in Costa Rica. Our brand Parrot Floral Greens is recognized in the market for its consistent outstanding quality. We provide an ample variety of floral greens (foliage) like: leather leaf fern, aralia (fatsia japonica), cat palm, phoenix roebelinii, cordeline and some other tropical floral greens, all of them under the Parrot quality standards. Established in 1991, we proudly market and sell products from our farms of more than 120 hectares (300 acres). We are an experienced, environmentally conscious company and currently we employ over 200 people whose health and well-being is a priority for the company. 100% of our production is exported to different countries in Europe, and North and South America. Helechos de Cuero S.A. is a participant of the MPS-ABC certification. It means that our environmental performance becomes more transparent and demonstrates that our operations are environmentally friendly. 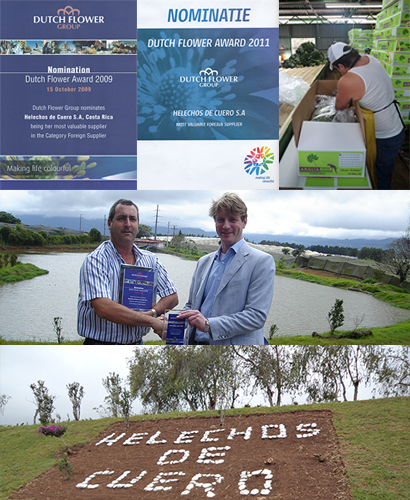 Our main client, the Dutch Flower Group of Holland had nominated our company as the most valuable supplier in two years (2009 and 2011) and granted us the Dutch Flower Award 2009 in the Category Foreign Supplier. In December 2013, the government agency that manages the occupational health and safety in Costa Rica (INS Salud Ocupacional), made a public recognition of the efforts made by Helechos de Cuero S.A. in its occupational health and safety.